Wrought iron gazebos have an ageless beauty that make them an excellent structural accessory for your garden or landscape design. They can become a stunning focal point and entertainment spot in your landscape design or be the ideal place of retreat in your garden. An unadorned iron garden gazebo is a magnificent structure that can enhance the beauty of your lawn. They are available in a diverse selection of styles and sizes. It doesn't matter whether you select a gazebo that features intricate detailing or one that features a more simplistic design, the structure itself is sure to garner compliments from people passing by or visiting your home. Although, the gazebo alone is a piece of art, there is often an irresistible desire to decorate a gazebo. Decorations can be added to the gazebo to keep it current with the changing seasons and holidays. In the warm months of the year, a gazebo is an ideal place for climbing vines, hanging baskets and planters filled with colorful flowers. A gazebo can be furnished with outdoor living and/or dining furniture making it a comfortable place to entertain a small group of friends. Weekend brunch, afternoon tea or after dinner drinks can be enjoyed in a gazebo. As you browse through garden and landscape photo galleries, you'll see that you can add a tile floor to a gazebo area, place the gazebo on an elevated foundation or let the lush green grass serve as a carpet for the interior of your gazebo. Few things could be more relaxing than spending some quiet time in peaceful solitude inside the gazebo you've placed in a semi-secluded area of your yard or garden. Occasionally, you might want to share your retreat with the kids or grandchildren. This would be a good place for story time. The versatility of iron gazebos and their diverse designs make it possible for you to include one of these beautiful structures in almost any landscape design. A gazebo is a garden or landscape design feature that encourages you to enjoy its presence. If you would like to redecorate your home, then an understanding of the principles of design will help. You can design spaces that are comfortable and functional with a little planning. Start with one room at a time to make the project easier. Keep a notebook of photos of rooms you admire to give you inspiration for your decorating project. Visit online furniture showrooms to get more decorating ideas. Antique interior shutters are a popular way to emphasize windows. Consider the elements of color, furniture and accessories and window treatments when designing a room. The best way to make a small room look larger is to declutter. Get rid of furniture and accessories that you do not want anymore by donating them to your local charity. The easiest way to accomplish this is to remove everything from the room and bring back only items you love. If you have a photo of your favorite room, it is easy to duplicate the look. Clutter makes it impossible to see the beauty of a room. Antique interior shutters can be the focal point of the room. Do not install draperies or curtains over these shutters since this will distract the eye from the shutter’s beauty. You can decorate any room in your home even if you are on a budget. Painting a room will give it a new look that cost less than $100. Other focal points in a room include fireplaces, wall hangings or furniture groupings. Place a large rug under your conversation area to emphasize the space. Accessories such as pillows should coordinate with the colors in the room. Light colors make a room look larger while dark colors make it look smaller. Consider traffic patterns when grouping furniture together in the room. There are many ways to incorporate annuals and perennials in the home landscape. These flowers can be planted directly in the ground in garden beds. Another option for an easy, quick update to porches and decks is using an urn planter pedestal. Raised planters are an ideal solution for homeowners looking to beautify their property. Urns placed on pedestals on either side of the front entryway makes a lovely welcome. Multiple pedestals can be strategically placed on a patio to create an attractive barrier between neighboring yards. Additionally, a few planters on pedestals can be used to divide the patio seating area into garden rooms. Choosing the plants to include in the planter is quite simple. Once the location for the pedestal has been determined, decide whether this area will be in full sun, part sun/part shade or full shade. A trip to the local plant nursery will offer the greatest selection of appropriate flowering plants to fill the planter based on the amount of sun it will receive during the day. Potting soil should be used in the planter. Topsoil is not a good choice because it does not have the proper nutrients for the flowering plants that will be placed in the urn. A rule of thumb for selecting the flowers is to choose one plant that has height such as an ornamental grass or fern; this will be placed in the center of the urn. 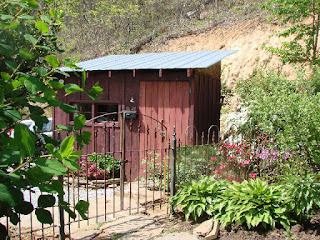 Then choose pretty flowering plants that will bloom throughout the growing season to place around the tall center plant. Finally, choose trailing plants that will spill outside the urn. Good options include sweet potato vine, sedum or ivy. An urn can be planted differently depending on the look the gardener is trying to create. An evergreen boxwood shrub, surrounded by cascading ivy, is a classic look. Billowy Queen Anne’s Lace will create a cottage garden feel. For a formal design, clipped topiaries placed on an urn garden pedestal, is a perfect choice. Wrought iron has a timelessness that can add long-lasting beauty to your landscape. Wrought iron fencing is an enduring, attractive way to define your entire property or a specific portion of your property. A small wrought iron fence is an excellent way to outline a garden. A simplistically styled fence can function as unobtrusive framework for your flower garden. The beautiful collection of colorful blooms will still be visible through the fence. Small wrought iron gates are available in various designs. A gate that features a smooth curved top would complement the simplistic theme. If you prefer, you can select a more decorative gate that will add elegance to your fenced area. Whenever you think of a gate, you probably visualize it as the entry way into an enclosed area. If you put that vision aside and let your creativity take charge, there are other ways a gate can be used. A free-standing small wrought iron gate can be used as an accessory in your garden. You can lean it against a tree and use it as a support for a climbing vine. 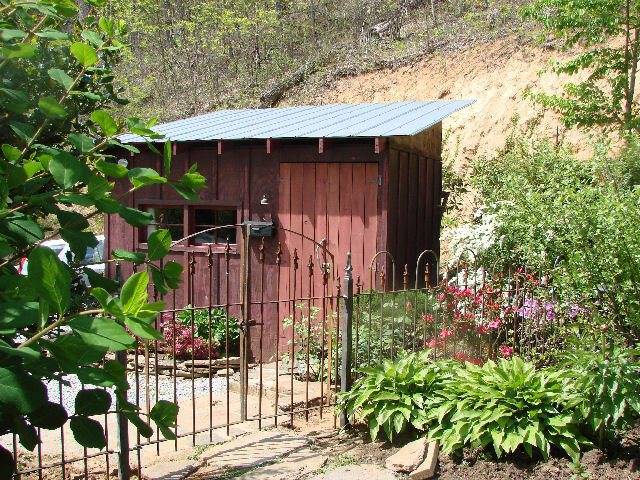 A small gate could be used as a "headboard" for a raised bed filled with colorful flowers. You can add a sense of mystery to your garden by placing a gate between two trees that stand near each other in the garden. The gate will make people pause to ponder what wonders await those who walk through the gate. In addition to using wrought iron fencing as a way to define a boundary, you can incorporate the beauty of wrought iron into your outdoor decor in numerous other ways. A wrought iron gazebo would be a stunning focal point for your landscape design. A wrought iron arch or trellis would also be an attractive addition to your outdoor space. A garden screen would add charm and character to a herb garden. Whether it's a large area you want to fence in or a small garden space you want to attractively frame, wrought iron creations are a durable, timeless and attractive way to accomplish your goal. A metal fence gives your yard or garden a nice, tailored look that allows you to see past the fencing for a better view of the landscape. Metal gates and fencing require regular maintenance to ensure it stays safe from the elements. Calculate the number of fence panels you need to get started. Call a utility company to come out and mark your gas, water, and other utility lines before you dig. Measure the area where you want to fence with a string and stakes. Ensure the area is straight and level before you dig your fence posts. You will need fence panels, posts, brackets, concrete, and gates. Posts that are secured with concrete are not difficult to dig using a post digger that you can rent or buy. Mark the post locations with spray paint to ensure the correct location. Posts that are topped off with caps or finials make a beautiful addition to your yard. Mark the screw holes for brackets below the top of the posts. A drill and masonry bit is required to install brackets. The fence panels are pushed into their correct position using a helper. Dig the post holes at least two feet deep and eight inches wide. You can rent an auger that is powered by gasoline to speed things up. Pour concrete into your post holes according to the manufacturer’s directions. Let the concrete dry for at least 24 hours before proceeding to the next step. Install fence panels using brackets, nuts and bolts that you purchase with your metal fence. Use more concrete when setting the posts for the gate. This will ensure the gate and surrounding posts are strong enough to handle extra wear. The hardest part of installing your own metal fence is the post hole digging. Rent an auger from your local hardware store to simplify this step. A metal fence adds beauty and warmth to your landscape while keeping pets and children inside your fence. It is not difficult to install your own fence, and you will save hundreds of dollars by not hiring an expensive contractor.